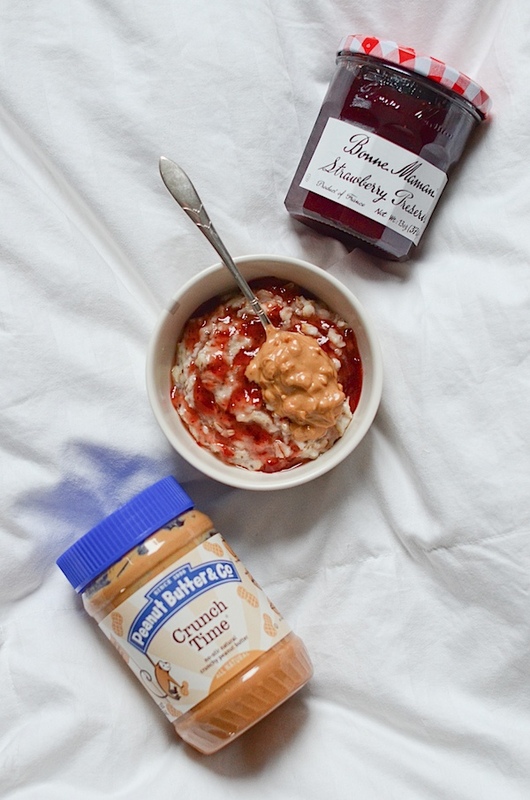 Winter is a great time to cozy up with a warm bowl of oatmeal. One of my favorite combinations is a twist on a classic. Today I’m sharing my Peanut Butter and Jelly Stovetop Oatmeal Recipe. And keep an eye out for a follow-up post. 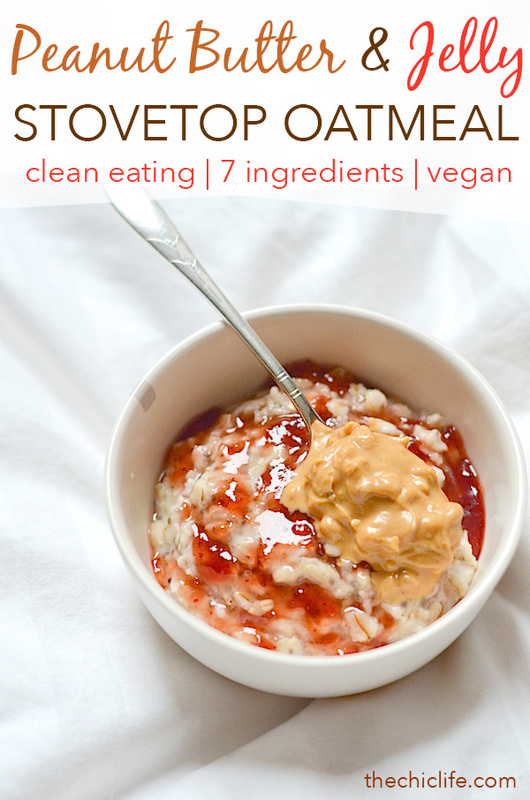 I’ll be sharing my best tips to get the perfect bowl of creamy stovetop oatmeal. Oh and be sure to subscribe to my email newsletter today if you want to be the first to see my latest recipe e-book. I’ll be sharing a preview photo later publicly. But only current newsletter subscribers will get a full copy before everyone else. Exclusives are fun, no? Note: this post contains affiliate links. If you make a purchase using these links, I’ll make a small commission at no charge to you. I’ve used and love the products recommended. If you have any questions, please don’t hesitate to contact me. If you’re anything like me, you probably grew up eating the classic PB&J sandwich. When I was brainstorming new flavor combos for oatmeal, I figured this one would translate nicely. I’m basically replacing one carb (bread) for another (oatmeal). I used Bonne Maman Preserve in Strawberry for the “jelly” and Peanut Butter & Co Crunch Time for the PB. I swirled the jelly on top, but I decided to add the peanut butter in one big spoonful. I love how the Crunch Time adds nice texture to the bowl. By the way, this four-pack of Peanut Butter and Co peanut butters is catching my eye. You get a smooth PB, a crunchy PB, and two of their signature flavors – Dark Chocolate Dreams and White Chocolate Wonderful. They are so good on toast on in oatmeal. Yum! I’ve blogged about them many times in my Eats posts because they’re so delicious. I normally add more toppings to my oatmeal, but this was simple and satisfying. Feel free to go crazy when you make yours. A twist on the classic. 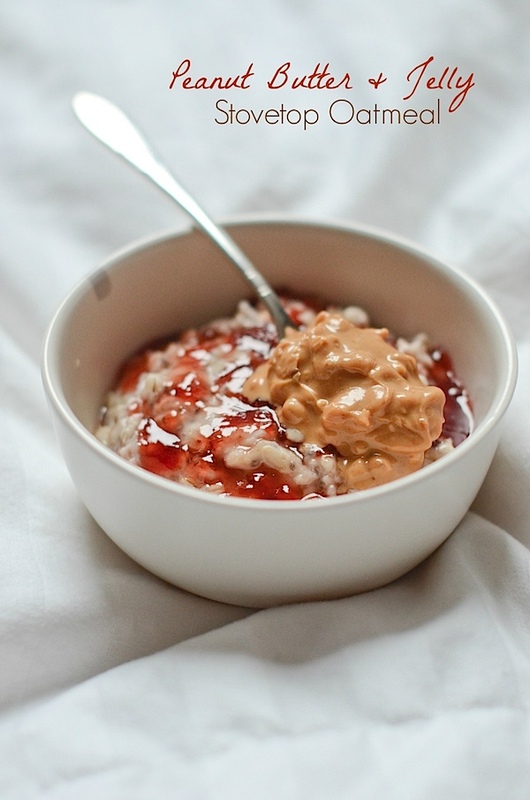 Peanut Butter and Jelly Stovetop Oatmeal is delicious and satisfying! I found adding the jelly on top made the bowl sweet enough for me, but you may want to stir in some honey while you’re cooking. In a small pot, stir together oats, milk, water, chia seeds, and salt. Cook over low heat, stirring occasionally, careful to not let the mixture boil. Continue cooking until the liquid is absorbed to your texture preference, about 5-8 minutes. Pour oatmeal into a bowl. Dollop the top with jelly and swirl lightly with a spoon. Add a spoonful of peanut butter on top. Add any additional toppings of your choice, and enjoy! I like smaller breakfasts, so 1/4 – 1/3 cup of oats is enough for me. You can easily increase the amount of oats used. Just keep the oats to milk to water ratio equal. Want something even faster but still healthy and delicious? Try this 2 Minute Yogurt Breakfast Bowl. Thanks for stopping by! Hope you enjoy this Peanut Butter and Jelly Stovetop Oatmeal Recipe.